O God, who through the grace of adoption chose us to be children of light, grant, we pray, that we may not be wrapped in the darkness of error but always be seen to stand in the bright light of truth. Through our Lord Jesus Christ, your Son, who lives and reigns with you in the unity of the Holy Spirit, one God, for ever and ever. According to the 1962 Missal of St. John XXIII the Extraordinary Form of the Roman Rite, today is the feast of the Visitation of the Blessed Virgin Mary, which in the Ordinary Form is celebrated on May 31. It is also the commemoration of Sts. Processus and Martinian whose bodies lie in a chapel at St. Peter's in Rome. During the time when Sts. Peter and Paul were prisoners in the Mamertine, legend says that these two jailors together with forty others were converted through the prayers and miracles of the holy apostles. They were baptized with water that suddenly sprang out from a rock. The jailors then wished to help the apostles make their escape. Both died as martyrs for the faith (about 67 A.D.). The Roman Martyrology also includes St. Swithin, bishop, from England on this day. The Anglican Church celebrates his feast on July 15, known as "St. Swithin's Day." 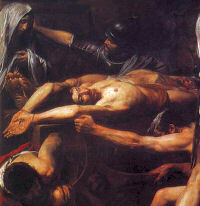 The jailer Paulinus learned about this, and he demanded that Sts Processus and Martinian renounce Christ. But they fearlessly confessed Christ, and they spat at the golden statue of Jupiter. Paulinus ordered that they be slapped on the face, and then seeing the resolute stance of the holy martyrs, he subjected them to torture. The martyrs were beaten with iron rods, scorched with fire, and finally, thrown into prison. A certain illustrious and pious woman, by the name of Lucina, visited them in prison and gave them help and encouragement. The torturer Paulinus was soon punished by God. He fell blind and died three days later. 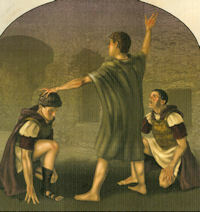 The son of Paulinus went to the city ruler demanding that the martyrs be put to death. Sts Processus and Martinian were beheaded by the sword (+ ca. 67). Lucina buried the bodies of the martyrs. Today their tomb is in the south transept of St Peter's Basilica in Rome. St Swithun died in 862 as bishop of Winchester. It is not known when he was born, but he was a secular clerk with something of a reputation for virtue and learning. He was attached to the West Saxon court and was one of King Egbert's principal advisers. He was given the king's son, Ethelwulf, the father of Alfred the Great, to educate; and to him must go some of the credit for the strongly religious tone of the West Saxon court under Ethelwulf and his sons. He was consecrated bishop of Winchester in 852, and as bishop was something of a builder. He may also have been one of the first contributors to the Anglo-Saxon Chronicle. A number of agreeably humble miracles were attributed to him - he was said to have restored a basket of eggs dropped by an old market woman when crossing a bridge. His great reputation for sanctity is, however, largely owing to the cult which sprang up at Winchester a hundred years after his death, in the time of St Ethelwold and the monastic reformation, when his body was translated. His shrine was splendid, but when it was looted by Henry VIII in 1538 its gold and jewels were found to be false. When he died he was buried at his own request in the churchyard, in order that the passers-by would walk over his grave and the rain fall upon it. It is always said that if it rains on his feast day, it will rain for forty days after, but it is not known how St. Swithun came to be associated with the weather. Similar stories are told of SS Medard, Gervase and Protase in France. This weather patronage traces back to July 15, 871 when the monks were translating his body (relics) from the outdoor grave to an indoor shrine in the Cathedral. The saint apparently did not approve, as it rained for 40 days afterward. Patron: drought relief; Stavenger, England; Winchester, England. Symbols: cross; rain cloud and rain; crosier and closed book. Read more about St. Swithin here and here. Read about the miracles of St. Swithin here. On July 2, the Church celebrates the life and work of St. Otto. He was born in 1060 in Swabia, and died on June 30, 1139. He was the Bishop of Bamberg, an indefatigable evangelizer, and the apostle of the Pomeranians. He was born of noble rank and ordained a priest sometime before the age of 30. He joined the service of Emperor Henry IV in 1090 and became his chancellor in 1101. He served Henry IV and his successor, Henry V, loyally, but he disapproved of the latter’s disgraceful treatment of Pope Paschal. Bernardino Realino was born into a noble family of Capri, Italy, in 1530. After an excellent Christian education received at home from his mother, he went on to study medicine and law at the University of Bologna, receiving his doctorate in law in 1556. A brilliant young man, Bernardino was soon on the road to success: at the tender age of 26, he was elected mayor as well as judge of the town of Felizzano. From there he became head tax collector in Alessandria, then elected mayor of Cassine, followed by his election as mayor of Castellone. Word of his learning, dedication, and legal brilliance spread throughout Italy, and the marquis of Naples named him superintendent of all his fiefs. While in Naples, Bernardino, now 34 years old, met some priests of the relatively new Society of Jesus and made an eight-day retreat with them. During this retreat he felt a strong call to the religious life and asked the Jesuits for admittance into their Society. He was accepted and ordained a priest in 1567. From that time on Bernardino devoted his life to the care of the poor and sick, to teaching the Faith to young people, and to ministering to galley slaves. He was appointed novice master while in Naples and remained in that city for ten years until he was sent to the south of Italy to the town of Lecci where he had been requested to found a college. He spent the rest of his life in Lecci where he was hailed as a saint during his lifetime, not only because of his powerful example as a preacher, confessor, and teacher, but also because of the many miracles he performed by the power of God. One of the miracles attributed to Bernardino was in regard to a small pitcher of wine which did not give out until everyone present had had their fill. Six years before his death at the age of 86, Bernardino fell and sustained two wounds which never healed. During his final illness, blood was taken from one of the leg wounds and placed in glass vials. After his death, the blood appeared to boil and foam and retained its liquid state until well into the mid-nineteenth century. So devoted were the people of Lecci to their saint, the magistrates of the town visited Bernardino on his deathbed and formally requested that he take the city under his patronage after his death. Unable to speak, Bernardino nodded his head, dying soon afterwards with the names of Jesus and Mary on his lips. He was canonized by Pope Pius XII in 1947 and is to this day considered the Patron of Lecci.